Image Comics is kicking off New York Comic Con 2013 with a BANG. Kieron Gillen and Ryan Kelly's Spartan drama THREE #1 sold out instantly, as did Amy Reeder and Brandon Montclare's ROCKET GIRL #1, the two newest debuts from Image Comics. Kurtis J. Wiebe and Tyler Jenkins' hit historical fiction series, PETER PANZERFAUST #15 released this Wednesday and has already sold out on a distributor level. ZERO #2, written by Ales Kot and illustrated by Tradd Moore, has also sold out on a distributor level one week ahead of its release to comic shops on 10/16, the second sell-out in a row for the new espionage series. All four issues are going back to press for second printings, the latest milestone in a year of massive hits and critically-acclaimed debuts from Image Comics. The comics market is responding to creator-owned comics in a big way, and none of this would be possible without the hard work and creativity of the creators behind the comics. PETER PANZERFAUST #15, ROCKET GIRL #1, and THREE #1 may still be available in comic stores, and both issues are available digitally on the Image website (imagecomics.com) and the official Image Comics iOS app, as well as on Comixology on the web (comixology.com), iOS, and Android. The second printings of THREE #1 (Diamond Code AUG138462) and ROCKET GIRL #1 AUG138463) will release on 11/13. ZERO #2's second printing debuts on 11/13 and can be pre-ordered with Diamond Code AUG138464. PETER PANZERFAUST #15's second printing arrives on 11/13 and can be pre-ordered using Diamond Code AUG138466. The PETER PANZERFAUST DELUXE HC, collecting issues #1-10, hits stores on 12/4 and can be pre-ordered with Diamond Code SEP130549. THREE #2 releases on 11/13 and can be pre-ordered now using Diamond Code SEP130644. 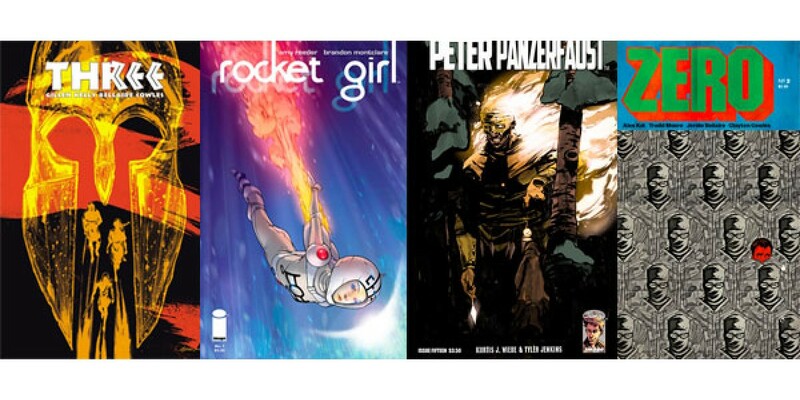 ROCKET GIRL #2 comes out 11/13, as well, and can be pre-ordered with Diamond Code SEP130633. ZERO #2 arrives 10/16, next week, and ZERO #3 goes on sale 11/20 and can be pre-ordered using Diamond Code SEP130651.